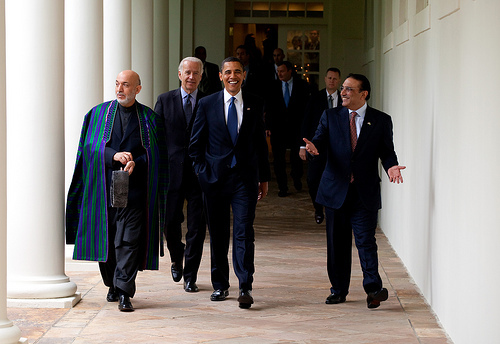 Barack Obama, Hamid Karzai & Asif Ali Zardari after trilateral meeting 5-6-09 1.jpg President Barack Obama (center) with Afghan President Hamid Karzai, Pakistani President Asif Ali Zardari, and Vice President Joe Biden. White House photo by Pete Souza. President Asif Ali Zardari of Pakistan is still in Europe, so far having chosen not to return to Pakistan on account of massive flooding. A NY Times story describes how the response of Pakistan's government to the floods has led to widespread public outrage (which I also noted in a previous post). The Times story also confirms what should not come as a surprise: namely, that Islamic groups are filling the vacuum. Given that some militant Islamic groups will undoubtedly gain support by taking the lead on relief, it may seem important that the West -- particularly the United States -- be seen to come to the aid of the victims. The other day I was tempted to write that humanitarian assistance would show Pakistanis that the West valued their lives beyond their country's strategic importance in some kind of Great Game. I suspect various Western foreign policy experts are busy scribbling memos something to this effect. But if any blogger or policy-maker imagines that demonstrations of US generosity will contribute to the political stability of Pakistan in the long term, they are likely mistaken. The question begs to be asked: why doesn't the government of Pakistan respond to disasters more quickly? Pakistani insurgency and instability has followed in the wake of massive US military aid to the country. One effect of this aid has been to render Pakistan's rulers less reactive to the needs of its people. A situation has arisen wherein, to the extent that Pakistan's leaders are accountable to anyone, they are accountable to Washington. These leaders believe they can safely turn a blind eye to a natural disasters -- and also to hunger, education, and civilian infrastructure projects. Meanwhile, civil society groups -- which in Pakistan mean Islamic groups -- seek to fulfill the unmet needs of the people, expanding their influence and political power. In the United States, when an administration backed by politically-active conservative Christian groups responded belatedly to human suffering caused by the flooding of New Orleans, it knew that various religious charities would seek to fill that void. Indeed, many victims of the hurricane, abandoned by their government, turned to religious charities. Bush administration negligence may well have bolstered an important constituency for the Republican Party. I'm not convinced this was a consciously thought-out strategy on the part of the Bush Administration at the time of Hurricane Katrina, only that there would have been an implicit awareness of the underlying dynamic. In Pakistan, might the slow response of the government to flood victims have resulted from a similar political calculation? Do power-brokers in Islamabad understand that government inaction can create opportunities for conservative religious groups with whom they are aligned? To the extent political violence in Pakistan is driven by religious extremists, and the perpetuation of violence assures Pakistan of continued military assistance from the US, why wouldn't self-interested Pakistani leaders be expected to sit back and do nothing? In the long term, the best way for the West to assure Pakistan's political stability is to pursue policies that encourage Pakistan's local economy to flourish. Particularly if Western aid is sent to Pakistan in an effort to compete with extremist religious groups, it needs to be recognized that latter are probably sourcing most of their aid locally. The kind of aid that local charities provide -- religious or otherwise -- is most likely to bolster locally owned businesses. It's not as likely to drive storekeepers out of business. In so far as economic stability is the key to political stability for Pakistan, the West should ensure that aid does not undermine the local economy. American helicopters began evacuating people and ferrying supplies this week. But some of the $35 million in aid put up by Washington will come in cash or be channeled through local or international groups, denying the unpopular Americans the chance to improve their image with Pakistanis face to face. Providing groups with cash that they can spend locally is ideal. Doctors Without Borders is setting up field hospitals in Pakistan and accepting donations at its website. It's Excellent post and also image. I liked it.